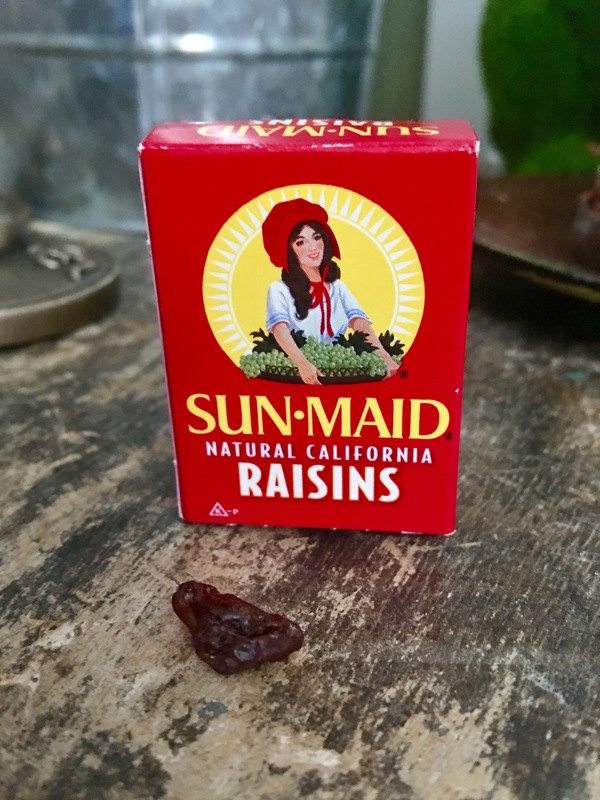 Who knew Raisins could be so transformative? I've never been a big fan of raisins. They sort of creeped me out. So, when Cory emptied bags of mini boxes of raisins on the table during the class I attended this past Sunday, I wasn't thrilled but I was excited for the exercise (If you did not receive the email I sent out about the class, you can read it here). Let's rewind a second: if you are new to receiving my emails, this may seem like a strange email. I agree. But hear me out before deleting and spamming me! Most of my emails are short, sweet and inspirational. This one will be a little big longer, as there is a lot of information here. So, the purpose of the raisins was to learn about Mindful Eating. This is a practice that brings us back to the present moment and allows us the unique opportunity to use all of our senses and really pay attention. So often, we eat on the fly, shoving food in our mouth almost unconsciously, not even tasting or enjoying the food or experience. And, often times we eat to fill voids, not because we are actually hungry. 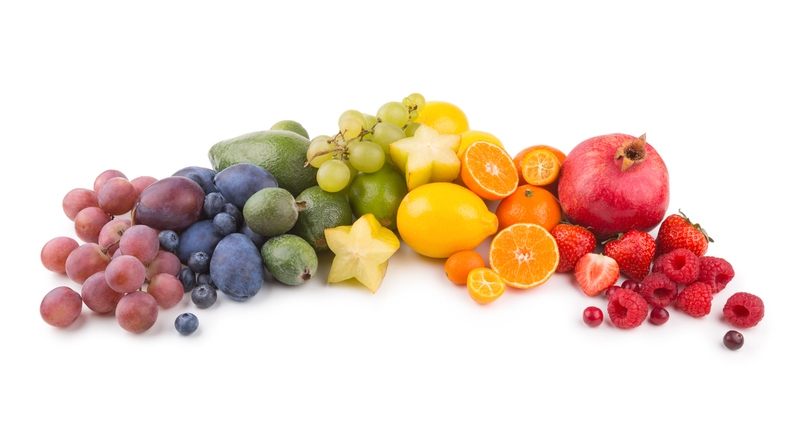 Through Mindful Eating, we learn to pay attention to our body's signals, messages and needs while also discovering how beneficial a simple practice can be (for those of you wanting to know some benefits of Mindful Eating, click here for a Google search that will bring up plenty of articles with information). So, what was this practice we did in class? It was really fun; I actually felt like a little kid and almost giggled in excitement and curiosity and amusement. * Pretend you are an Alien visiting this planet and you've never seen raisins before. * Take a raison out of the little red box. * Hold it in your hand, examine it with your sight for a few moments and find words to describe it. Mine happened to look like a brain! * Next, use a pointer finger to touch and feel the raisin. What does it feel like? What are some words you can use to describe it? * Bring the raisin up to your nose and smell it. What does it smell like? How would you describe the smell? * We laughed as we did the next part, because it is really weird and silly to think about hearing a raisin, but try it out, anyway. Some people said they heard crackling and popping. * Last, we put the raisin up to our lips and held it there for a second. By this point I was actually looking forward to eating the raisin even tho I never liked raisins! Cory asked us to pay attention as our tongue and lips participated in bringing the raisin from lips to mouth. Then we chewed and tasted the raisin, slowly, paying attention to the sensations and whatever came up for us. So, what is the point here? After this exercise, I was sort of alarmed at how unconsciously I eat my food. With 3 kids at home, half the time I am chewing what's left of my food that I haven't given away, carrying a baby, cleaning up and waitressing for the other 2. I have little to no involvement in the eating process, let alone enjoying it or being present in the experience of it. This little raisin changed the way I view food and my daily activities which look more like sleep-walking on autopilot than living. I thought to myself, "Wow, who can stay unhealthy when they practice mindful eating?" For one, we learn to eat when we are hungry... (what a foreign concept!) and not just to fill a void with junk food, or have an emotionally/boredom-induced overeating session (guilty!). Ironically, I lost my sense of smell and taste due to congestion and a cold the day following the course. At this point, I began eating foods for nourishment alone since I couldn't taste anything anyway (lots of green drinks I don't normally like). When my taste and smell came back today, it was exhilarating and I am so grateful for all these senses we get to enjoy but often take advantage of. We spend so much time unconsciously living life, we don't even realize we are driving to work, eating food, or showering. Our mind is elsewhere, our thoughts are scattered and often not productive or helpful. A simple practice like Mindful Eating (even if we just try to practice it here and there) can curb so many of our vices, and eradicate sources of unhappiness. Like I mentioned in my last email about Mindfulness Meditation, the benefits to practicing Presence in your everyday life are enormous and backed by much scientific data at this point. You are here to live your life, boldly and authentically, and to experience the world through your senses. Your physical body gifts you these amazing privileges and while we are here, why not enjoy what we can? There will always be hard days, challenges to overcome, and pain... but we can choose with every new breath to become aware, mindful and cherish the everyday moments in our lives. I'll be reporting my real-time results from my commitment to Mindfulness Meditation everyday until the next class Cory teaches in April. So far I am only on day 3... but I am loving it now that I actually gave it a shot. The power lies in the shift of focus and awareness, and detaching from all those nagging thoughts that normally rule our day. Let me know your thoughts and experience(s) if you care to give Mindful Eating or Take Five a try! If there is anything I can do to support you on your journey to transformation, please do not hesitate to reach out. Take 5...or 10....0r 20. Just take 1 if you have to, but take it! I went to a class yesterday in Plainview, "Mindfulness for Beginners" with Cory Muscara. So much of what I learned just reaffirmed messages I have been receiving lately and nudges that my intuition has been trying to get me to notice. Not just notice, but to pay attention to and put into practice. Cory calls Mindfulness, Shifting from Surviving to Thriving. He talked about how to "shift from living on “automatic pilot” to living with greater awareness, presence, and intentionality." And the route he teaches to get you there is Mindfulness and meditation. So many people think of meditation as something far-out-there or something they "can't do" (I was one of them - I wanted to learn to meditate but didn't know how or if I could quiet the mind long enough to). The class was a great start to the practice, and I really enjoyed it. As Cory validated, so often we live on "auto pilot" and are not really present. Our bodies are someplace, but we are elsewhere (our minds, with thoughts in the past or future). It's so healthy for us to stop and take a few moments, even just one minute, to become aware and present fully in the moment. Here and Now. The health benefits and scientific studies around the benefits are impressive. And so many companies, organizations and schools are adopting these principles because of the findings and evidence showing how important meditation or mindfulness is to productivity, reduction in stress and illness, and overall wellbeing and happiness. We all deserve to give ourselves the peace of mind that can come from Mindfulness Meditation. You can start with as little as one minute a day. Cory taught us an exercise that can be done in about 30 seconds called, "Take Five." * You look at the palm of your left hand and trace your fingers, one at a time, up and down with your right pointer finger, beginning at the thumb. * Align your breath with the finger motions, as you go up, inhale... and as you draw down your finger, exhale. Continue to do this each finger. * Pay attention as the finger slides up and down, the sensations you feel, and really absorb that experience and moment. * If you catch yourself "thinking," simply say"oh, that's a thought" and let it go without judgment, bringing yourself back to the exercise and present moment. If you like, you can then move onto the next hand. Or do it, again, on both hands. Something as simple as this can bring your awareness to the present moment, shedding negative thoughts for long enough to ground you in peace and bring you back to yourself. Give it a try and let me know what you think. I am committing to meditating everyday until his level 2 course in April. I'll keep you posted on what comes up for me! And I'll be back to share with you an awesome exercise he did with a raisin! Sounds silly, but it was so powerful. Love and light to you, my friend. I've always been one to enjoy a dessert item after eating. It's just been a habit I formed based on craving sweets after meals. It never became a problem and I never thought anything of it... until this week. I have been reaching for more and more (vegan) chocolate, cookies and anything sweet throughout the day, more often. It's like my appetite for it became insatiable. It wasn't until someone tried to pin me down with "diabetes" and asked why I was eating so much sugar that I realized perhaps there was something more to this sweet craving than I originally thought. From my health coaching schooling, I know that cravings can say a lot about us, our needs and what's going on both physically and emotionally. Cravings can indicate a nutritional deficiency but they can also alert us to emotional deficiencies. Sweet cravings are probably the most frequent craving people report to me. These people are often working too long and hard, moving from one to-do list item to another and feeling exhausted. The real reason for this craving is they aren’t experiencing enough joy — it's evaporated into their daily grind. As a working mother of three girls, two of them under 3 years old, I find little time to enjoy life and often hop from one to-do to the next, leaving a laundry list (and lots of actual laundry) behind of things I didn't yet get to that have to get done. Sleep is lacking, the winter brought with it many "bugs" that kept the children awake through the night, uncomfortable, and rest is considered a luxury that I cannot often afford. Paired with my struggles lately that have been popping up on the emotional journey after committing to ditching the defensive attitude I sometimes react with, books I have been reading that trigger things inside of me, and a general lack of time to do what I enjoy and makes me Who I Am, it's just no wonder I reach for the sweet stuff. My body has been craving joy. And while there are healthy food alternatives to the sweet stuff I reach for, nothing - and no one - can fill that gaping hole except for me. Our body is always speaking to us. The awareness it brings can lead us to powerful discoveries that help us through to transformation. Finding out what I did on Google was no coincident. I needed to find this, read it and realize what is missing. It's now my job to make myself whole, again, and make healthier choices for my life. Our internal guidance system is always on, always sounding off alarms and guiding us where we need to go. It speaks to us on the regular. Once we begin to listen, and trust this inner wisdom, we are on the road to discovery, healing and well-being. 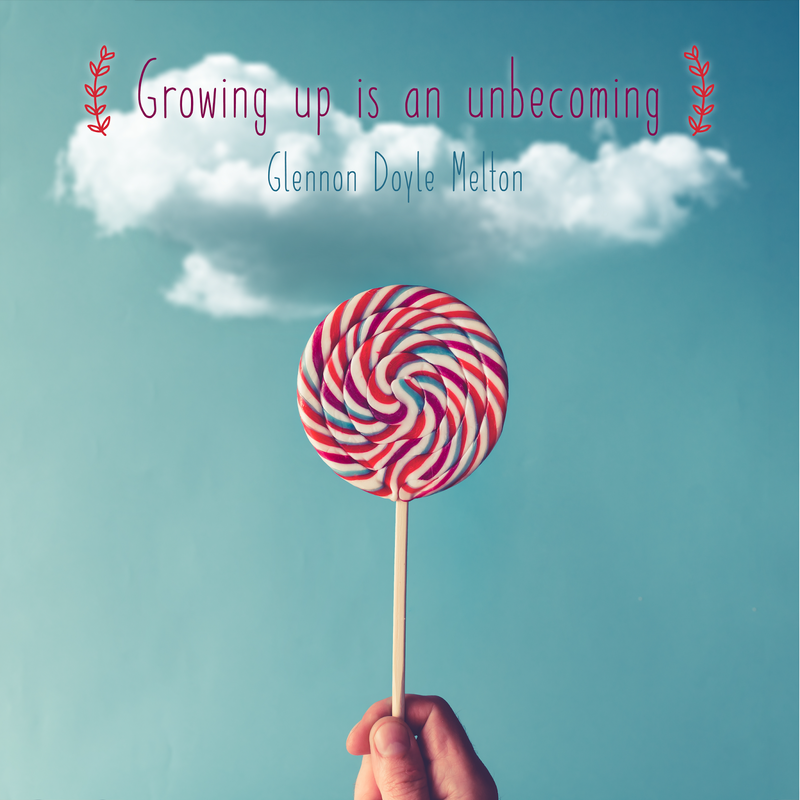 Growing up is an "unbecoming"
I've been reading an amazing memoir book by Glennon Doyle Melton, made famous by her raw and open blog, Momastery. 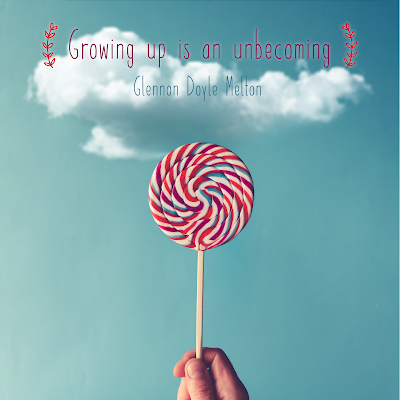 One of her recent realizations in the chapter I am on is about how becoming a "grown up" means unbecoming... we are always seeking to become something bigger, better, or do something more, better, different. But so much about learning our Soul Lessons is about undoing, unlearning, de-conditioning, deprogramming... going back to the Start of it all. Going back to who we were before the world had its affects on us. So much of who we are is lost in the world as we "grow up" and maybe part of "growing up" spiritually means re-learning and reclaiming those parts of ourselves, maybe just some of them, or by at least becoming aware of them. Removing ourselves from the conditioning, the judgments and the self-limiting beliefs we have picked up, learned, programmed in our psyche and basically brainwashed ourselves with for years and years. Part of living happily is living authentically. Getting to the core of Who We Really Are. 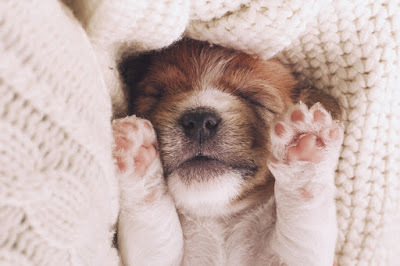 Today, I wish you precious moments, reclaiming stolen memories, and a day of peace as you sift through the chaos of things and find Who You Really Are, and what really makes you happy. Let your Soul sing today... even if just briefly. I had shared an Instagram video on Facebook yesterday and went on (which I rarely do these days) last night to edit the hashtags. I watched the video then hit something on the screen by accident. It brought me to a video I posted years ago when I was more active, personally, on Facebook. From a video of my Rottie, Raja, jumping through the snow when I lived in my co-op, to a video of my eldest daughter when she was just a few years old, singing, to a video of my late Rottweiler, Ursa, playing in the snow... one by one, I watched the videos with major nostalgia. It was at that moment that I truly realized how the small, everyday moments are what really create our life. These are the memories that we make, the feelings we take with us, the laughter and joy and tears and pain. All of it. At the time, our everyday lives may seem insignificant or mundane, but these moments become buried treasures. Once uncovered, they gift us with access to true, priceless gems. Sure, at the time I took a video of my dog playing, I was laughing and enjoying myself. Or when I recorded my daughter singing to a cartoon on TV, I thought it was uber cute. But finding those videos last night really warmed my heart, and I felt like I recovered a lost part of my journey. I had forgotten all about those moments. And I was able to appreciate them so fully, for the beauty I had surrounding me. And all the love. Now that my Ursa girl has passed on, and it's been many years since, or my daughter has been growing up so fast, I can look back and realize that perhaps I could have been more grateful for what was right in front of me... all the time. Not just some of the time. I could have been more present. I could have showed up more fully. Normally I don't encourage use of the words, "should, would, could" but in this case, looking back, that lesson was really driven home for me. Cherish the everyday moments...they are the moments that slip away, that we wish we could relive once they are over. How I would just jump at the opportunity to play with Ursa one more time, or snuggle with my daughter when she was my only child and we had all the time in the world to be together one-on-one. It may seem difficult when we are faced with busy lives and messes, spread thin, or overcoming obstacles and stress, to be mindful, present and live fully in each moment - especially when those days seems humdrum or less than exciting or fulfilling. But there is always something to be grateful for. There is definitely something we have right now that one day we may miss and wish we still had. Life moves on; it is always evolving and so are we. Presence and gratitude are two keys to a life lived with more joy, peace, love and fulfillment. These everyday moments are what make up the tapestry of who we are, and our great adventure on this fascinating planet in our miraculous, beautiful bodies. 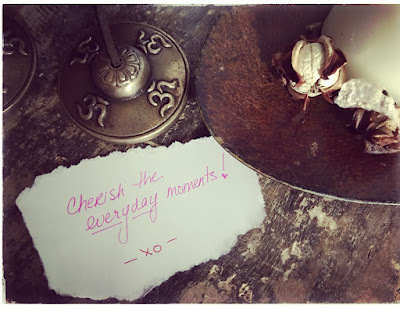 Today, I encourage you to cherish the everyday moments. Be fully present and aware, as much as you can be. Keep practicing and it becomes easier and easier to access this mindful space where love and beauty are the focus and feelings that surround you.